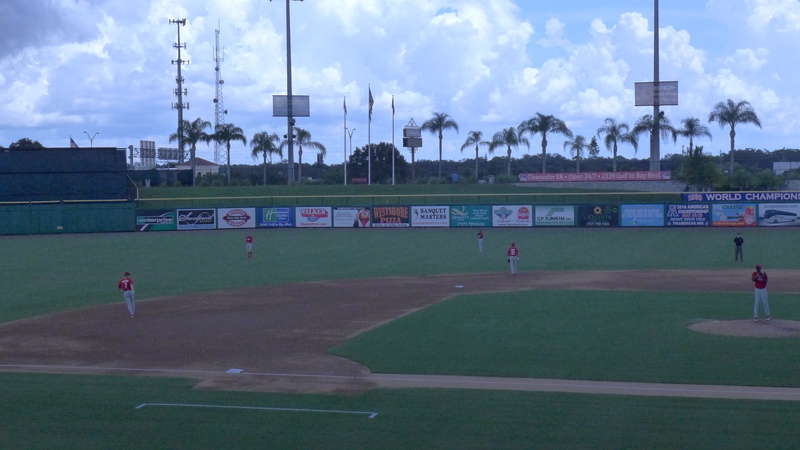 The Phillies played their first game of the Florida Instructional League season on Monday. Players began reporting last Sunday, September 18th. They spent the week in early morning meetings and indoor workouts before taking the field for routine drills similar to those held in spring training. Instructs brings the newest and youngest players in the organization together. There are 62 players on the roster. Thirteen of 32 position players suited up for the game. Six of 30 pitchers saw action. Four teenagers from Venezuela saw action today. Simon Muzziotti started in center field. Catcher Rafael Marchan entered as a substitute, as did SS Brayan Gonzalez and 2B Jesus Henriquez. Franklyn Kilome got the start. Here are a couple photos of him pitching in the first inning. I think he’s pitching to Blue Jays’ prospect Vlad Guerrero. Kilome was coming off a great start in the playoffs for Lakewood. He demonstrated an easy, fluid motion as he threw his fastball 92-94 mph. His off speed pitch came in around 84 mph. He struck out the first batter. Kilome walked a batter and gave up a single in the first inning. The inning ended with “C” Randolph throwing out a runner at the plate, Randolph to Edgar Cabral. 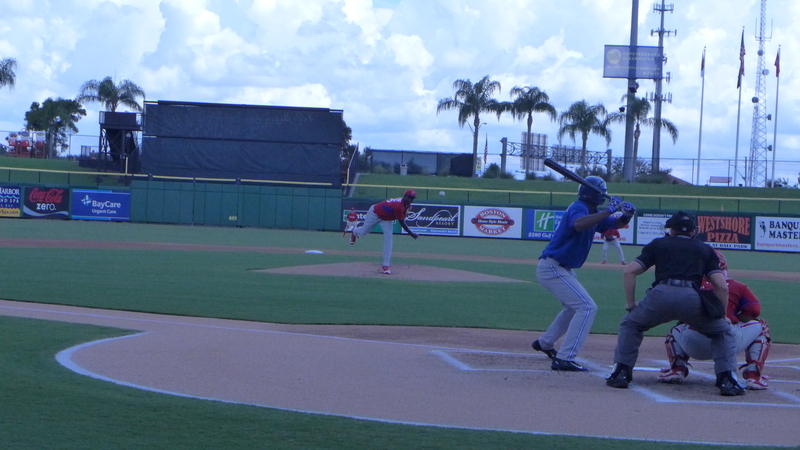 Kilome walked a batter to start the first inning with lightning in the area. the game was stopped with a one-ball count to the next batter. Here’s video of one of his pitches. The Phillies jumped out to an early lead in the bottom of the first. Simon Muzziotti and Malvin Matos opened the home half with singles. Randolph followed with a no-doubt-about-it home run to the right field berm. I didn’t get any video of these at bats, but C’s blast cleared the fence above the green Quality Inn sign between the two white ones. 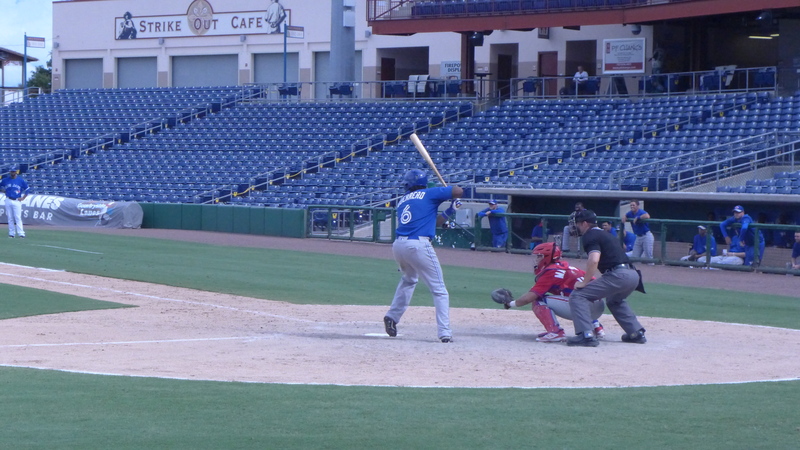 Edgar Garcia entered after the weather delay and easily retired the Blue Jays to end the second inning. He threw his fastball 92-94 mph and disposed of the Jays in a 1-2-3 third inning. The Phillies mounted another rally in the bottom of the third with the help of the Blue Jays. Muzziotti reached on an error by the third baseman. Matos chopped a single thru the hole into left field. Randolph reached on a fielder’s choice that loaded the bases when the second baseman “cheated” and was ruled off the bag at second. Randolph easily beat the relay. 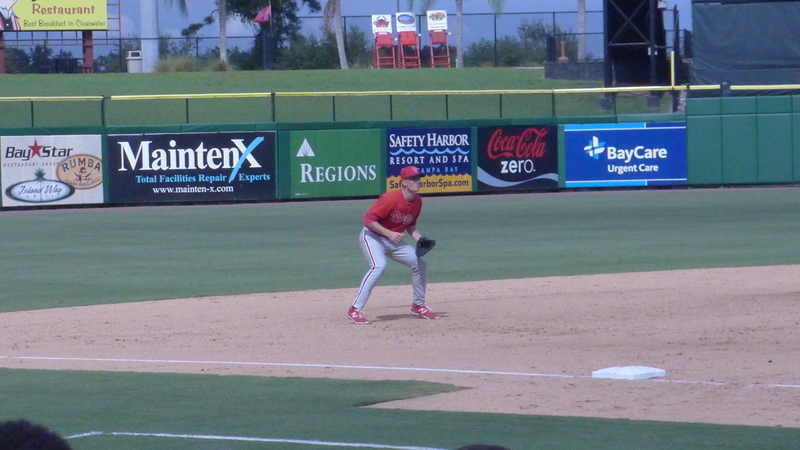 Darick Hall reached on an error by the shortstop that scored a run to put the Phillies up 4-0. And the Blue Jays “rolled” the inning to avoid any further damage. Nick Fanti entered to pitch the next two innings. The young lefty dominated the Jays with his pin point control. His fastball was 88-90 mph. He walked one and struck out two. Two routine fly balls to left and two ground outs to second rounded out his outing. 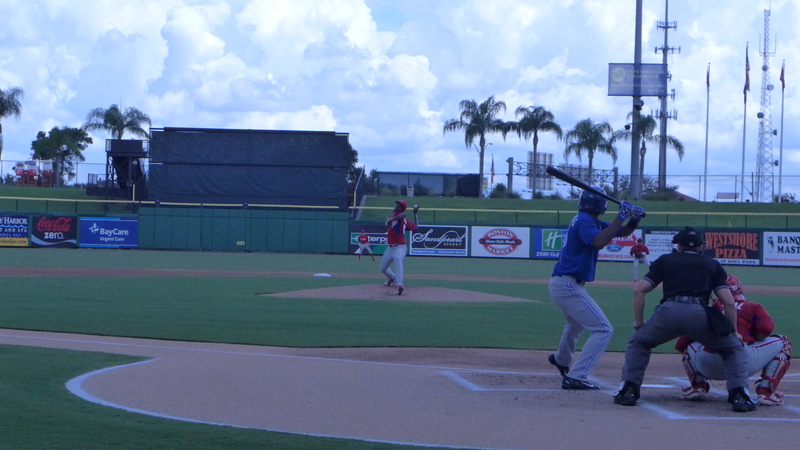 Here’s a photo of one of his pitches and video of another. Jordan Kurokawa came on to pitch the sixth inning. He started with a walk and a double (Guerrero) off the left field wall. 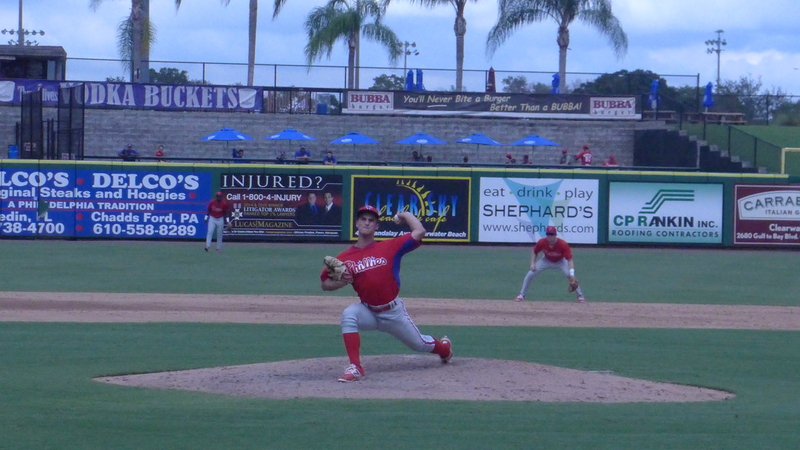 The Phillies had made some changes, and the new left fielder threw to the relay man to nail a second runner at the plate, this time Josh Stephen to Brayan Gonzalez to Rafael Marchan. The next batter homered to left to get the Blue Jays on the board. The Phillies’ defense looked a little out of sorts for the next two batters. An infield single was chopped into the no man’s land among the pitcher, first baseman, and second baseman. Indecision led to no one covering first. The next batter bounced a come backer to the mound, and Kurokawa’s soft toss to the second base bag sailed over the fielder. Fortunately the play was backed up. A fly out and ground out ended the inning. Jose Nin entered for the seventh inning. His 92-94 mph fast ball kept the Jays at bay with two ground outs and a backward K. Nin’s mastery came to an end in the eighth. A two-run home run and RBI double gave the Jays a 5-4 lead. Jonathan Hennigan came in to quell the rally with two strike outs. His fastball registered 89-91 mph. The Phillies bounced back to tie the game in the bottom of the inning. Brett Barbier lined a lead off single followed by singles by Josh Stephen and Simon Muzziotti to score the game tying run. The inning ended with three infield pop ups. Hennigan was tagged with a couple of unearned runs in the ninth. An error by the Gonzalez put the lead off runner on base. He stole second and moved to third on a ground ball to the pitcher. The go ahead run scored on a wild pitch. Hennigan got the second out with a strike out. A double drove in an insurance run and the inning ended with another strike out. The Phillies went quietly in the ninth on 2 K, one reaching on a WP, and a double play. 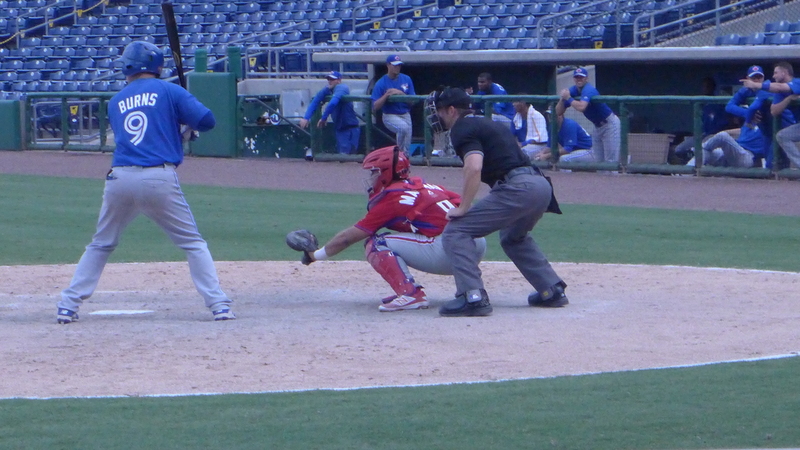 Rafael Marchan crouching for the pitch. Luke Williams at the ready. 8 Simon Muzziotti went 2-4. 9 Malvin Matos went 3-4 with a CS. 7/DH “C” Randolph went 1-4 with a 3-run HR. 3/DH Darick Hall went 1-4. 2 Edgar Cabral went 0-2. 6 Cole Stobbe went 0-1 with a BB and CS. 4 Daniel Brito went 0-1 with a HBP. DH/3 Brett Barbier went 1-2 with a BB. DH/7 Josh Stephen went 1-3. Most of the Phillies’ hits were bloops and bleeders over and through the infield. The hardest hit balls were Randolph’s home run (of course) and Barbier’s line drive single in the eighth. There were a lot of people in attendance. I think the Phillies’ staff out-numbered the scouts in attendance. I approached Joe Jordan to follow up on a question Romus asked last week. For those who missed the Q & A in the comments thread, Romus asked if Simon Muzziotti’s Rule 5 clock started over when the contract he signed with Boston in 2015 was voided by MLB and he resigned with the Phillies this year. I opined that I didn’t think it fair that the player be penalized for the organization’s misdeed. But that MLB exists to protect owners not minor league players. So, I asked Mr. Jordan. He said that it was his understanding that Muzziotti’s Rule 5 clock started when he signed with the Phillies. That means the Phillies still have 5 seasons of control over Muzziotti and he won’t be Rule 5 eligible until the 2020 Rule 5 Draft. Mickey Moniak was present but left early to catch a flight to Philadelphia. Word circulated among us informed fans that he is scheduled to see a doctor in the Philadelphia area. Remember that he sustained an injury during the GCL playoffs. He was removed from game one of the finals against the Cardinals as the DH after his second at bat and didn’t play in the final two games. 9/26 – Reading activated LF Andrew Pullin from the 7-day disabled list. 9/26 – Reading activated LHP Mario Hollands from the 7-day disabled list. 9/26 – Reading activated RHP Tom Eshelman from the 7-day disabled list. 9/26 – Reading activated C Joel Fisher from the 7-day disabled list. JimP…thanks for that information, good to hear the Phillies have that extra year with Muzziotti. I had visions of another Ender Inciarte event happening with him as it did with the D-Backs and Phillies back in the spring of ’13…but this time the other team keeping him. And does Vladimir Guerrero Jr look anything like his father? Physically, he looks a little smaller than I remember his father. While he was on the field at third base, I remarked that he looked like Maikel Franco, but he’s slightly smaller than Franco, too. However, I saw him during ST and XST. He punishes a baseball when he makes contact. He has the same type of vicious swing that I attribute to his father. Jim, you said there were alot if people there, hope not to crowded ,planning on going Saturday. My son loves interacting with the players and I hope he gets a chance to. A lot by Instructional League standards. Around 100. This Saturday, the game is at the Complex next to bright House Field. Free parking and free admission, as always. Bring sun screen. Depending on which field they use, shade will be at a premium. Game starts at at 10:00AM. No concessions, and sometimes the beverage machine isn’t fully stocked or requires exact change. Thanks, for some reason I thought game was at 1. Moid would have been diffrent after 1 1/2 drive and seeing we missed game. Good to hear everything about the Phillies prospects. And a great Eagles win this weekend. Too bad about Jose Fernandez though. I am sure everyone liked him even if you are mets/braves/Nationals of us Phillies fans that play against him 3 ish times a year and against his old team 19 times.